This board functions as a REAL tracking device. When powered up, a searching sound plays out - reminiscent of "radar" type search modes. A white LED also strobes in sync with this pinging sound. This LED can be used to backlight a screen to emulate a working unit. 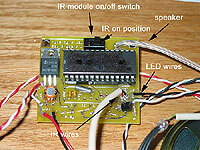 The infrared motion module detects motion and triggers the sound board to play out a gradient whining noise. The IR motion module can detect motion up to 10-15 feet. Once the module detects motion for more than ¼ sec., the tracker will begin to “whine”, denoting it has “spotted” a target. As motion is subsequently detected, the tracker will increase its pitch over time to emulate the target getting closer. The tracker board will increase its whine for every 3 seconds of motion that has been detected. Once motion is not detected, the tracker goes back to search mode state (just play out the pinging sound). The IR motion module is sensitive to human motion. Targets that stand still may not be detected. However, if you are moving with the tracker in hand, then still targets would be able to be detected since the IR module only cares about detecting motion (from a still target with the tracker moving or from a moving target with the tracker still). The onboard switch turns the IR sensor monitoring on and off. If you don’t want the IR module active, flipping the switch will turn it off. In this mode, all you hear is the pinging sound. Flipping the switch back will reactivate the IR motion detection mode. Small size: 1.5" x 2"